Our interview, training and vetting procedures ensure our staff are all highly dependable, careful, discreet and trustworthy. We focus on the latest advances in technology, safety, education and training to guarantee the best service and results for our clients. We visit locations in Exeter, Exmouth and surrounding villages in East Devon including Topsham, Sidmouth, Lympstone, Woodbury and Newton Poppleford. Contact us to schedule your free quotation and experience the highest level of window cleaning service. Water-fed poles let our window cleaners work safely, in full compliance with occupational health and safety rules. Busy Bees staff are all fully insured so in the event of an accident you can rest assured Busy Bees will take care of everything. 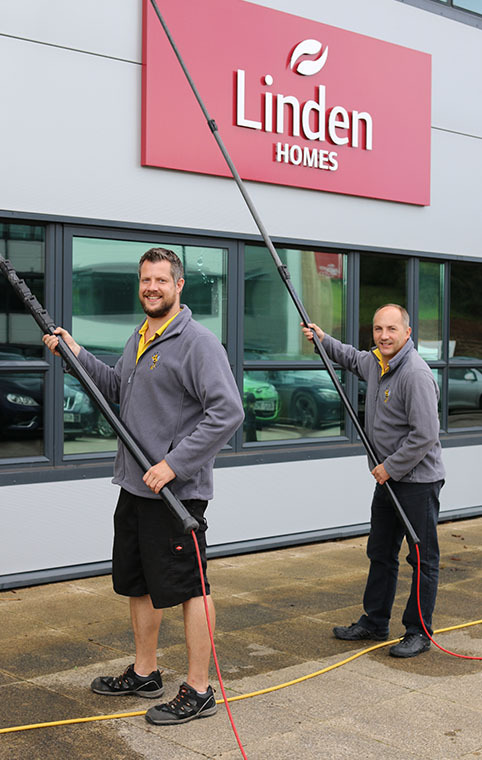 Other than the obvious safety benefits using poles reduces disturbance to buildings and grounds, maintains client privacy and makes inaccessible windows easy to reach whilst still achieving exceptional cleaning results. At Busy Bees we use the power of science to bring you a natural, highly effective cleaning solution. Our system uses several processes with the goal of making the purest demineralised water. Once the pure water is applied to your windows it returns to its natural impure state, whilst absorbing the dirt. The dirt infused water is then rinsed off with more Pure Water resulting in a sparkling clear and streak free finish. We have invested in the best technology available to ensure that we can provide the highest quality results for our clients. Unlike many other systems, our system not only purifies the water, but it heats the water too. The benefit of this being that the hot water softens and removes deeply engrained dirt more effectively. Impurities in tap water can leave a film on the glass which encourages dirt to adhere to it. Thanks to our Pure Hot Water Solution windows look better for longer.